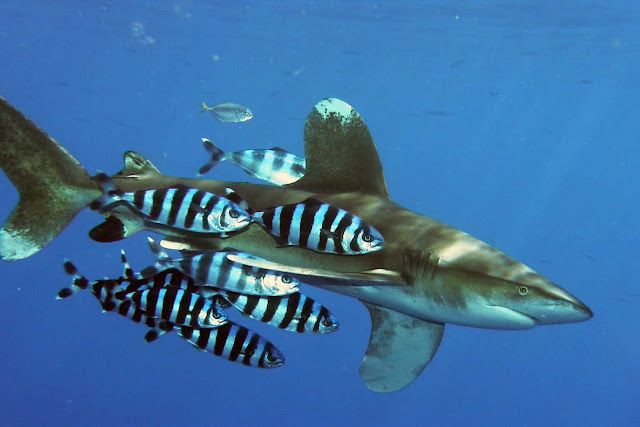 I was recently bemoaning the sorry state of the Oceanic Whitetip Shark and mentioned that there was just a Conference of the Parties (CITES) meeting in Bangkok earlier in March to look at their protection. 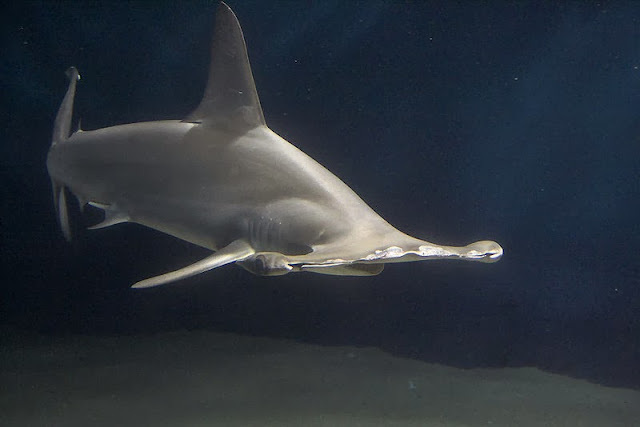 What was only a few years ago the most abundant large predator on Earth is now little more than a memory thanks to overfishing and shark finning. I also made mention of the fine work of Dr. Shelley Clarke who estimated from market surveys that between 26 million and as many as 73 million sharks were harvested each year worldwide. Her best estimate was 38 million sharks killed annually. We may have had that wrong. On March 1, 2013, "Global Catches, Exploitation Rates and Rebuilding Options for Sharks," was published by Dr. Worm and three other researchers from Dalhousie University teamed up with scientists from the University of Windsor in Canada, as well as Stony Brook University in New York, Florida International University (FIU) in Miami and the University of Miami. A very powerful team indeed. Their shocking findings are that shark fishing is now globally unsustainable. Their more recent estimates put the carnage at 97 million in 2010. The possible range of mortality is between 63 and 273 million annually. This equates to somewhere between 7,200 and 31,000 sharks per hour. "Sharks are similar to whales, and humans, in that they mature late in life and have few offspring” said Boris Worm. “Our analysis shows that about one in 15 sharks gets killed by fisheries every year. 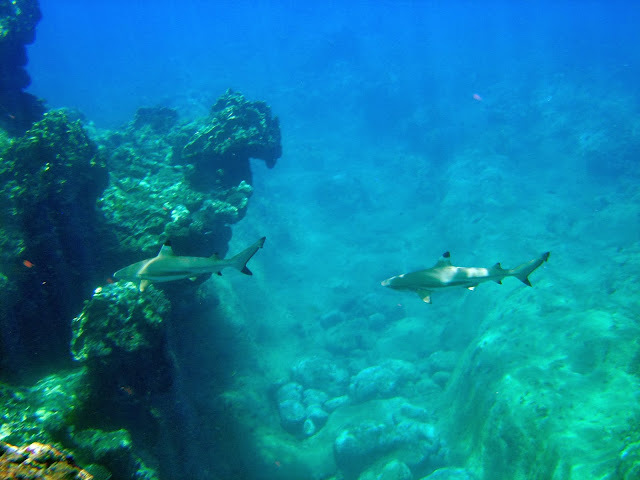 With an increasing demand for their fins, sharks are more vulnerable today than ever before." Why am I so upset? It was never fun swimming around in a 1000 m of water with things described by Jacques Cousteau as "the most dangerous of all sharks". Why should I care if they are gone? The research I was doing at that time looked at the make up of the marine fish community as it was exposed to fishing pressure. 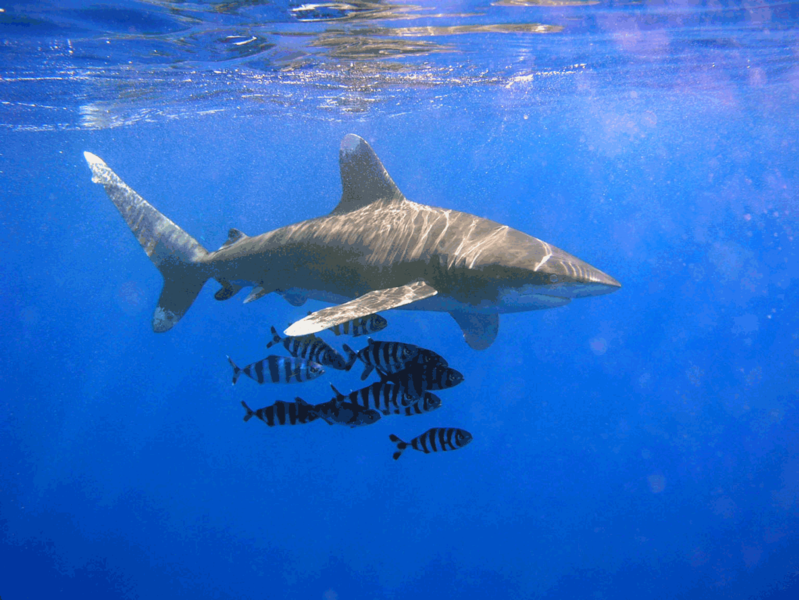 Specifically, to fishing aimed at top predators on the coral reef. I was trying to find out how much fishermen were reducing the stocks of valuable food fish on the Great Barrier Reef. I found that stocks were devastated by up to 95% in some places. But I discovered something that wasn’t known before. I came up with a mathematical expression that predicted changes in the entire fish community. I published the work in 1982. That’s right! Not just the species the fishermen were catching; it looked like everything changed and more importantly, it looked like it might never change back. Sadly, this idea didn’t catch on and was buried in scientific libraries. Everyone believed that if you left things alone for a while they would repair themselves and go back to the way they were in the “good old days”. This comes from the idea of ‘renewable resources’ and is the way we see the world around us. The years past and things started to go very wrong in the Caribbean. Reefs there were being over-run by seaweed, fish were gone, and corals were dying. From about 2000 researchers were looking at a variety of possible causes. By March, 2009 researchers had found that fish abundance that had been stable for decades had given way to significant declines from 1995. By June, 2012 Dr. Roff had completed a study raising concerns about the future of Caribbean coral reefs. Seaweeds were blooming so fast that corals were unlikely to recover in the absence of enough seaweed eating fish. Now in March, 2013; "This is a big concern because the loss of sharks can affect the wider ecosystem," said Mike Heithaus, executive director of FIU's School of Environment, Arts and Society. "In working with tiger sharks, we've seen that if we don't have enough of these predators around, it causes cascading changes in the ecosystem, that trickle all the way down to marine plants." Such changes can harm other species, and may negatively affect commercial fisheries, Heithaus explains. Science has been nailing the problem down to over exploitation of the apex predators – sharks and some groupers. It was during the last two years that this research caused my early work to be dusted off and looked at again. My 1982 concept is now becoming a cornerstone of contemporary thinking in coral reef management. Put simply, we must have all the species in reasonable numbers if we are to maintain healthy and sustainable fisheries. Eliminating an apex predator is like pulling a couple of ‘chips’ out of your computer. It still runs but it doesn’t run the way you want it to. In my earlier work I forecast that “the concept of renewable resources may not be broadly applicable to the coral reef and the relationship between (apex) species abundance and (change) – may be less a management tool than a picture of the demise of the reef fish community as we know it”. Fancy words? Not really. Where nature is concerned we just have to understand that most of the time we don’t understand. We can’t go into an ecological system that evolved hundreds of millions of years before man set foot on the planet and think we can exploit it however we wish and that it will simply cope with our being there. If we can learn anything from natural history it is that when systems begin to collapse there is a point from which there may be no turning back. If you doubt this then ask the dinosaurs for their opinion.